Sowatt brings a passion for people and enthusiasm to his role as a Sales Consultant. He loves meeting people and developing relationships with them, ultimately assisting them to achieve their dreams of buying and selling homes. Sowatt truly believes that persistence and dedication drives his success which makes him a vital team member at WeSell REAL ESTATE. Clients have complimented his high level of professionalism, honesty and persistence throughout the entire process from listing the property and beyond settlement. Having lived most of his life in the Keysborough area, Sowatt has a solid understanding of what makes it so great. He is slowly building up his own property portfolio. In his free time you’ll find Sowatt playing soccer or enjoy camping and outdoor activities with his family and friends. 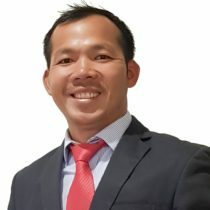 Speaking fluent Cambodian is an added advantage for Sowatt allowing him to efficiently converse with Cambodian clients. You can be sure when choosing Sowatt Huynh and WeSell REAL ESTATE that you will receive the highest level of customer service.